Ohio State coach Urban Meyer watches the team’s spring game in Columbus, Ohio. Ohio State has placed Meyer on paid administrative leave while it investigates claims that his wife knew about allegations of abuse against an assistant coach years before he was fired. 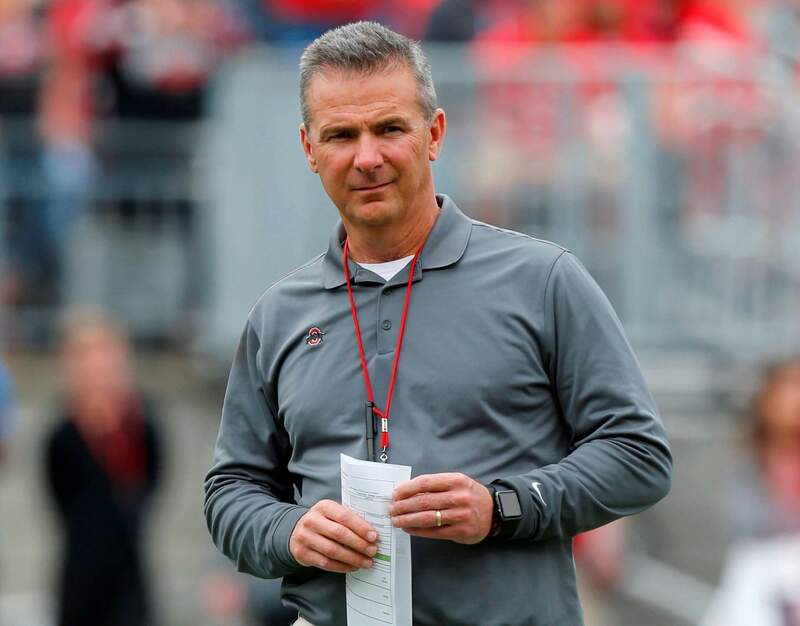 COLUMBUS, Ohio – The Urban Meyer investigation is costing Ohio State $500,000, but whether the superstar football coach keeps his job still comes down to whether the university wants to stick with him based on how he’s already been tainted by the scandal. But Meyer has already given his bosses plenty to consider – he says he knew of domestic violence allegations against Zach Smith before he brought Smith to coach wide receivers at Ohio State, and that he reported new accusations properly when they surfaced in 2015. WHY FIRE MEYER?Meyer knew about a 2009 domestic incident in Gainesville, Florida, when Smith was a graduate assistant coach for Meyer’s Florida team. A police report says that during an argument Zach Smith picked up a pregnant Courtney and threw her against a wall. Zach Smith was never charged. Knowing that, Meyer allowed Smith to stay on staff at Florida and then brought Smith in at Ohio State. Meyer also knew about the 2015 abuse allegations , but Smith – the grandson of former Ohio State coach and Meyer mentor Earle Bruce – kept his job until Courtney Smith filed for a restraining order on July 20. The Meyer investigation plays out at a time when the school itself – and college athletics at large – is under scrutiny around the handling of misconduct allegations. Ohio State has a growing list of more than 100 former students and athletes who say they were groped and otherwise mistreated by Dr. Richard Strauss, a deceased athletic department doctor who worked at the university for nearly 20 years. There are questions about whether Republican U.S. Rep. Jim Jordan knew about the abuse when he was an assistant wrestling coach at Ohio State during the same time. WHY KEEP MEYER?Meyer said he followed “proper protocol and procedures” after finding out about the 2015 abuse allegations. OTHER OPTIONS?Ohio State could suspend Meyer rather than fire him, if university leaders want to retain him while still delivering some punishment for keeping a coach around for so long despite accusations of domestic abuse. A key detail for investigators will be whether the Title IX office or athletic director responded properly – if they were indeed informed. Citing the investigation, the university would not make those officials available for comment when contacted by The Associated Press.